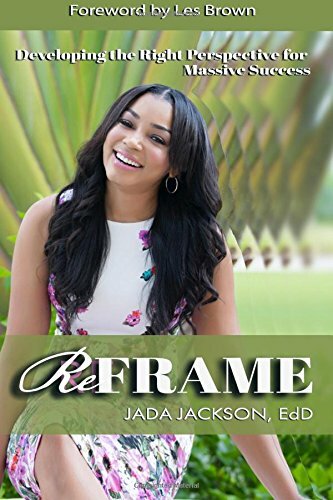 ReFRAME Your Life with Dr. Jada! Are you overwhelmed with life’s changes? Have you gone through a divorce? Had a baby? Changed jobs? Switched careers? In REFRAME–Developing the Right Perspective for Massive Success keynote speaker Jada Jackson talks about how to manage life’s losses and common transitions by reframing negative thought processes. Dr. Jada will help get you refocused and back on track! As a Licensed Mental Health Counselor, Jada shares how she struggled with life’s transitions and emerged to living a life of contentment, peace, and massive success. Using personal stories, case studies, and practical, applicable solutions, she gives a clear road map for those who want to stop losing and start winning! This book will encourage you to: · Identify destructive thought patterns · Set healthy boundaries · Rebuild confidence · Engage your best energy · Reframe losses into wins · Maximize your potential for success Life is in your control. If you want to stop losing and start winning, this is your opportunity to Reframe your Life! The 3-day retreats are created differently for each group of women, but based on the same premise: Dr. Jada’s book ReFRAME. This ReFRAME curriculum is designed to provoke women to grow deeper in their spiritual awareness and to “let go” of negative narratives that prevent ultimate success. Dr. Jada and her team wants to empower women so that they create honest spaces in their lives to address shameful decisions, regretful experiences and/or negative relationships. Additionally, you will be challenged to face complicated faith-based questions that have gone unanswered. After the retreat is over, you will be given the opportunity to engage in weekly, bi-weekly and/or monthly small groups with women for accountability and support. Book you coaching session TODAY! Learn simple, applicable emotional management tools for personal stress relief, professional clarity, and/or relationship maintenance. CLICK BUTTON above to quickly schedule your 1 hour session with Dr. Jada. Get up close and personal with the coach of celebrities, pro athletes, Olympic gold medalists, and corporate leaders. No matter who your are or what you do, you NEED to learn effective emotional management skills. GET STARTED RIGHT NOW! I love sharing my experience and knowledge about life, love, success and personal growth. Generosity | Is it really better to give than receive? Standard Sessions are 60-minutes and include an initial free 30 minute phone consultation at least one day prior to the session for assessment. Are you a Therapist, Life Coach, Lifestyle Expert, Wellness Coach or Business Professional? This is your opportunity to take your brand to another level! If your business needs a quick upgrade, join my Marketing Masters’ class for “quick” tips to boost your brand. Quick Sessions are 30-minutes and include an initial free 10 minute phone consultation at least one day prior to the sessions for assessment. A 4-hour workshop designed for women with a passion to excel personally and professionally. A 2-hour Expressive Arts Therapy Group for adolescent girls. A 4-hour workshop for couples to explore healthy communication skills and stronger intimacy tools for a happier union. A 4-hour workshop packed with business ideas, strategies, and networking opportunities for take your career to the next level of success.